Aubert J Fay was a self-made millionaire who earned his fortune by manufacturing and distributing a very popular cough suppressant. He worked his way from humble beginnings to president and treasurer of an organization that produced a product that is still in existence today. Like so many other wealthy business owners from the north, Fay looked to the south for a reprieve from the cold season. Aubert and his wife, Gertrude, were from Lowell Massachusetts and chose Miami as a place to look for their winter home. The home they purchased in Brickell ended up being the last one standing in Point View from the days of its prominence as Miami’s Gold Coast. Aubert Fay was born in Manchester, New Hampshire, in 1860. His family moved to Lowell, Massachusetts when he was a small child. His father took a job working at the print department of a local textile mill. Aubert was raised and schooled in Lowell. After graduating from high school, he went to work in the Lowell Carpet Company mill for a short time before relocating to Boston for other opportunities. Fay later returned to Lowell and partnered with a friend to build a couple of businesses. In 1888, he and his partner built the Lowell Opera House. The partners operated the opera for two years. A short time later, through a connection from one of his brothers, Aubert got involved with the Carleton & Hovey drug store. Over time, he was promoted into an executive position with the company. He made his fortune as the company grew. The company’s growth can be primarily attributed to the popularity of a cough suppressant which had its origins in city of Lowell. The story of the origin and growth of Father John’s cough syrup became folk lore. In 1855, a very popular and benevolent priest by the name of Father John O’Brien took ill. He walked down to the Carleton and Hovey drug store to find relief for his cough. He was given a tonic that consisted of, among other things, cod liver oil. The formulation had a licorice taste. Unlike most cough remedies of the day, alcohol was not one of its ingredients. It worked so well for the priest that he immediately began recommending the concoction. He told folks to go to Carleton and Hovey and ask for Father John’s Medicine. After a while, a legend, and a product, was born. As the medicine grew in demand, the pharmacy built a factory and entered into an agreement with the pastor. He would get paid a small stipend to allow the company to use his name and likeness. In addition, anyone he personally referred to the pharmacy would not have to pay for the product. Over time, the demand for the medicine grew. All of the production, packaging and shipment was done at the factory on Market Street in Lowell. By 1900, Aubert Fay was the president and treasurer of the growing company. His personal wealth grew as the company achieved commercial success. By 1916, Aubert and his wife wanted to enjoy the spoils of their success by spending their winters somewhere a little warmer than Massachusetts. Locke T. Highleyman was the developer and builder of the Point View subdivision. He also constructed several homes in the subdivision. One of the homes that he built was a spec home constructed with the intention of providing a model home to showcase the area. The address for that home was 1402 South Bay Shore Drive. Ultimately, Highleyman built four homes in Point View. The first home he built was for his family at 1412 South Bay Shore Drive and was located two lots south of 1402. Shortly after moving into that home, he sold it to J.P. Logan in February of 1916. One condition of selling the home was that he be given enough time to construct a new home for his family. At the time, he was committed to staying in Point View. Shortly after selling the family home, there was a knock on the Highleyman door. Aubert and Gertrude Fay were in Miami looking for their winter home. They noticed the spec home for sale, so they knocked on Highleyman’s door to arrange for a showing. Neither Locke nor his wife were home when the Fays unexpectedly arrived for a tour of 1402 South Bay Shore Drive. However, the couple’s son, Daly, was home and knew where his father kept the keys for 1402. He grabbed the keys and walked the Fays through the home as if he were an experienced real estate agent. Aubert and Gertrude were very impressed and made an offer on the home shortly after seeing it. In March of 1916, the Fays bought the home for $22,500. For his effort, Daly Highleyman was awarded a bicycle as his real estate commission. While maintaining homes in both Lowell and Miami, the Fays were very committed to both areas. Lowell Massachusetts was where the couple built their business and Miami was their escape from the harsh winters of the north. The family continued to travel to Miami every winter. Aubert was fifty six when the couple bought their Point View home in 1916. He was far from ready to retire, so he would work from his winter home while away from Lowell. As the couple got older, they spent more time in Miami. On December 26, 1944, Aubert Fay passed away at the age of eighty four. Gertrude took over as president of the Father John’s Medicine Company, but still retained ownership and visited her Point View home frequently. 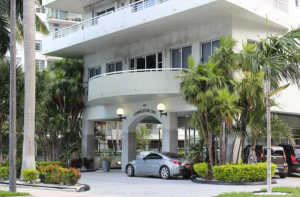 The Miami City Directly listed Gertrude Fay as the resident of 1402 South Bay Shore Drive through 1966. Although it isn’t clear when she passed away, there was an estate sale conducted at the home in August of 1971. Real estate records indicate that ownership of the home also changed the same year. Frederick Allen Bliss owned and operated Biscayne Sailboat Rentals at Dinner Key. He was a World War II veteran who served as a pioneer radar instructor and served on the USS Evans as a radar operator. After he got out of the army, he got sand in his shoes and moved to South Florida. As an avid sailor, he incorporated the Commodore Rowing and Sailing Club in December of 1964. 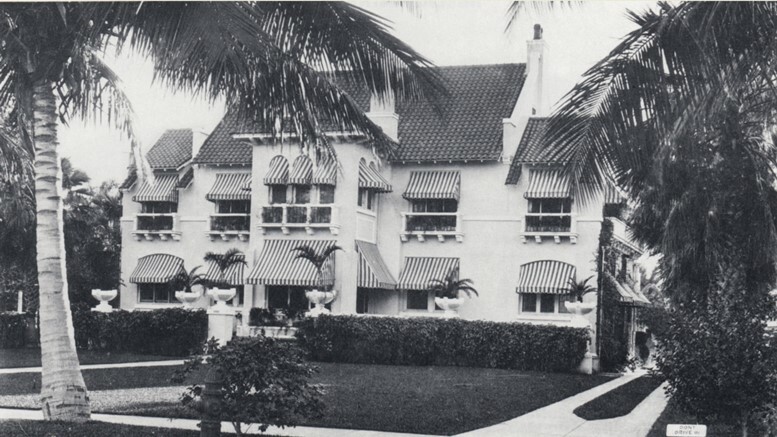 Given the proximity to Biscayne Bay, the former Fay home was an ideal location for the club when it became available. 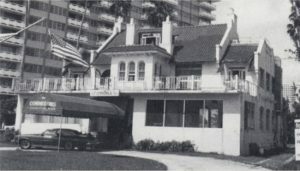 Bliss purchased the home for $192,100 in the summer of 1971 and converted it to the Commodore Restaurant and Club. Members and residents in the area remembered the club being one of the few social venues in the Brickell neighborhood during the ten years it operated in Point View. The neighborhood was changing from an upscale area with fine homes to a jungle of apartment buildings that was attracting a more transient crowd. By 1980, it was clear to Bliss that running a club in Point View was not going to be viable economically. He said that he was paying more in property taxes than he could afford. Allen shut down the Commodore Club and began to try to get the property rezoned to commercial office space. The Point View homeowners association fought his bid, and eventually Bliss was denied the zoning change. His only option was to sell the property. Figure 4: Vacant Commodore Club in 1981. Babylon Apartments being built in foreground. On July 5, 1981, Allen sold the property to an investment group for $1.3 million. They purchased the lot and home with funding from Alamo Investments. The group was interested in building a condominium complex, but was unable to secure enough additional financing to move forward with the project. On November 12, 1984, Alamo Investments foreclosed on the property. As part of the foreclosure, Alamo Investments secured an advance of $1.25 million from Sunshine State Bank. Sunshine State Bank also owned and financed the construction of the Babylon Apartments, which is located next door to 1402 South Bay Shore Drive. By August of 1985, Sunshine State Bank was linked with drug smugglers and money launderers as part of Miami’s Cocaine Cowboy era. A Cuban drug smuggler, Jose Antonio Fernandez, provided the funding for the purchase of the bank. The idea was to have Miami bankers Ray and Rafael Corona run the operation while Fernandez was a silent financier. Ray was thirty seven years old when he was made chairman of the small South Florida bank with the purposes of laundering drug money for Fernandez. Ray Corona was a flamboyant banker that was often seen wearing expensive Rolex watches, dressing in silk suits, and driving a Rolls Royce. By November of 1985, Ray and his father, Rafael, were convicted and given fifty years for money laundering. These events placed the ownership of the 1402 property in a state of flux. In 1988, the FDIC foreclosed on Sunshine Bank’s assets, including the former Commodore Club. In the meantime, the home had been vacant for almost eight years by the time of the FDIC foreclosure. The building was taken over by homeless and deemed unsafe by the city. In September of 1988, the building was razed. On March 11, 1989, FDIC sold the vacant lot for $875,000 to a group that eventually constructed a mid-rise condominium complex. It took five years from the time of the sale, but the group finally erected a fifteen story building in 1994. In his recollections of growing up in Miami, Daly Highleyman remembered the former Fay home as being the last of the Point View homes left standing. Later in his life, he lived in an apartment next to 1402 South Bay Shore drive and reflected on how much the area had changed. After the demolition of the home, the land sat vacant until the Commodore Bay Condominiums were erected in 1994. Point View began to evolve from elegant single family homes to the row of condominium towers it is today. This transition began in 1961 and was completed with the Commodore Bay in 1994. The demolition of the former Fay home was the last domino to fall for the original incarnation of Point View. 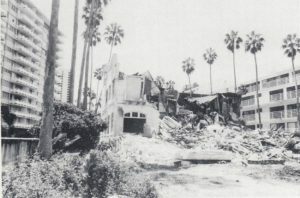 While Daly lived long enough to see the last of the original homes razed, he did not witness the completion of the final piece to the condo canyon. Daly passed away on December 31, 1990. Not only has the building landscape changed dramatically in Point View, so has the main street name. The portion of South Bay Shore Drive that comprised Miami’s Gold Coast of the early twentieth century experienced a name change in the mid-2000s. The Miami City Council passed a resolution in 2004 to honor the Brickell family by changing the name of a portion of South Bay Shore Drive, north of Fifteenth Road, to Brickell Bay Drive. In Miami, the old adage that “change is inevitable” has certainly held true. Miami Herald: “South Bayshore Drive Land”, July 5, 1981. Sun-Sentinel: “Bank Owner Given 50 Years in Prison for Drug Smuggling”, August 2, 1985 by Joseph Cosco. Cover: Fay home in 1916. Courtesy of HistoryMiami. Figure 1: Father John’s Medicine. Figure 2: Fay home in 1916. Courtesy of HistoryMiami. Figure 3: Commodore Club in 1970s. Courtesy of HistoryMiami. 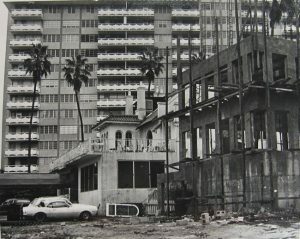 Figure 4: Vacant Commodore Club in 1981. Babylon Apartments being built in foreground. Courtesy of HistoryMiami. Figure 5: Demolition in September of 1988. Courtesy of HistoryMiami. Figure 6: Commodore Bay Condos. 1 Comment on "Fay Mansion in Point View Brickell"
Having been born and raised in Miami from the mid 40’s until leaving in 1963 I am so grateful for the articles and pictures of the homes and places of that era being brought back to life. Reminding me of what is lost to so much of my childhood and up through most of my teen history. It is wonderful what you are doing to save and document this part of Miami history for so many of his scattered throughout Florida and the rest of the USA.